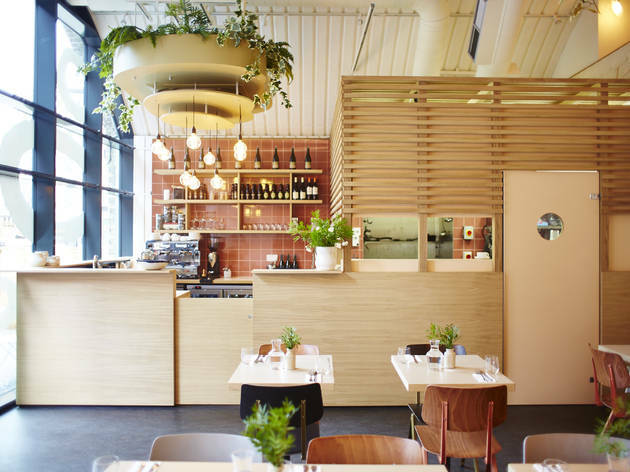 A bright and buzzy pancake house in Flat Iron Square. Who doesn’t love a pancake? That’s the simple premise behind this bright new addition to Southwark’s Flat Iron Square, and it seems to be working – I had to wait 20 minutes to get a table on my visit. It’s easy to see why: the buttermilk beauties served here have just a hint of sourness, managing to be substantial and moist without stodginess. In other words, flipping perfect. The intriguing menu is split into sweet and savoury. Take the Hummingbird, for example, with cinnamon poached pineapple, crushed meringue and a scattering of delicate flowers. Fancy, eh? 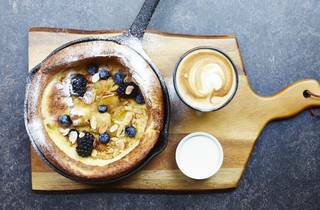 Or the Instagram-ready Dutch Babies, which are baked in an oven and served in a heavy black frying pan, from which they billow like enormous Yorkshire puddings blotched with goat’s cheese, cheddar and parmesan. Sure, it’s a bit more fiddly than a squeeze of lemon and sprinkle of sugar, or frazzled strips of bacon with a glug of maple syrup, but those are on the menu too if you’re in the mood for something more straightforward. The dining space is covered in soft woods, with a white powdered ceiling and a wall of felt discs that dampen the hubbub around you. The light fittings resemble upturned stacks of pancakes with leafy vines spilling over the sides and large bulbs with spiraling filaments; when viewed from the roomy mezzanine, they become fetching hanging planters. In short, Where the Pancakes Are makes a great brunch or lunch option as well as a nice place to go on your own if you’re looking for somewhere to cosy up and read a book. The best bit? You don’t have to wait until Shrove Tuesday rolls around for your next pancake fix. Wandering the streets of London Bridge and Bankside, strolling from Borough Market to Tate Modern, you will find us for breakfast, brunch, lunch or afternoon tea. 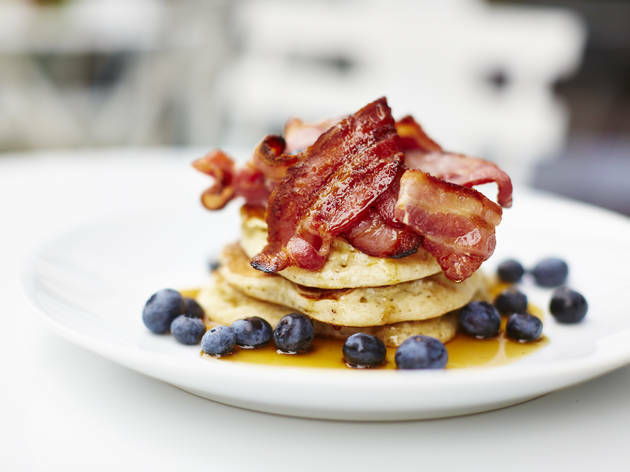 We serve sweet and savoury buttermilk pancakes all day, alongside the 'Dutch Baby' – a super delicious oven-baked pancake. Depending on the time of day, we serve great coffee, beautiful cocktails and a good selection of ciders and beers. For those with dietary restrictions and allergies, our vegan, dairy-free and gluten-free options should still allow you plenty of pancake satisfaction. Lunch for two with drinks and service: around £30. Unfortunately the service was really bad the sunday we went. After seeing this place on timeout we were excited to visit and expected to wait for a table. The lady who served us said 1 hour wait and put our name down on the waiting list. After waiting 1 hour we went back expecting a table which then she told us another 20 mins wait... (she tried arguing with us it hasn’t been 1 hour) we had to wait outside and it was cold and raining so we asked if we could order take out coffee while we wait and she said no she cannot serve us?? The outside table also had heaters which I asked if it could be switched on while we wait... again this didnt happen. Yes it was busy but nothing too crazy so I dont see how they couldn’t accommodate customers waiting outside in the cold. The tables should also have a time limit so other customers waiting can also enjoy. Very disappointed. Attention all pancake lovers, this is your Heaven! 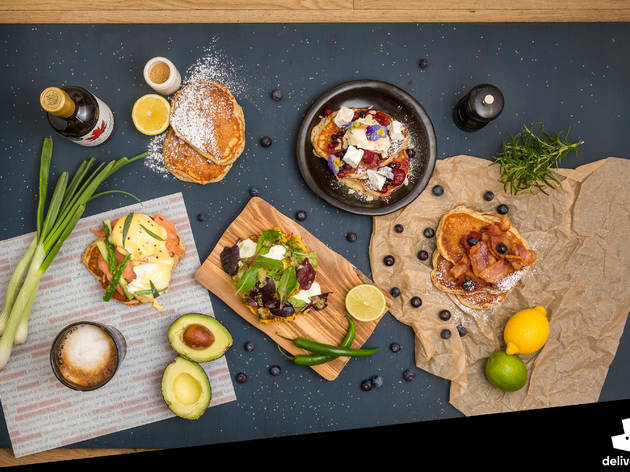 With a bright and light decor, this place offers pancakes with salad, as breakfast, sweet and savoury galore. They’re thick, soft proper pancakes topped with quality ingredients and served by a very friendly staff. Choose from stacking ones or Dutch ones - baked in their own iron cast skillet, and enjoy a fun brunch, a hearty breakfast or even a full on meal that goes straight to the heart. And with a name that cute, who can actually resist? But be warned: if you want your fix with no queues, come early on weekends! Best pancakes ever. They're so fluffy and light. Portions may be on the smaller size for some, but it was perfect for me and I finished everything on the plate. Definitely need to come back again as I changed my mind a dozen times before staff came to take our order and I'm usually so decisive with food. I should have just got them all, but I know my eyes are bigger than my stomach. Wheelchair access: step free entrance with accessible toilets *thumbs up* all round. Attention Pancake lovers: this is the place you will want to spend your weekend brunches from now on. 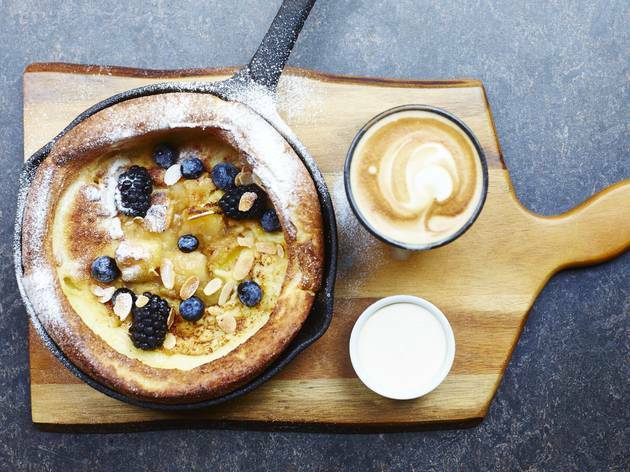 Located at the arches of the upcoming Flat Iron Square, this place has everything you need for a perfect weekend: sweet and savoury fluffy delicious pancakes, baked pancakes, great coffee, nice interior and super-friendly staff! Not to mention the great vibes of the place and its surroundings. Definitely recommended for seriously good pancakes. You’re either a pancake person or a waffle worshipper. Some might say you can be both but I say you only ever really want one or the other. Waffles have their place on the culinary landscape – done right, they’re light, fluffy and the ideal receptacle for criminal amounts of cream – but for me, a plateful of pancakes is hard to beat. Whether it’s syrup soaked, buttermilk beauties stacked tall & proud or lacy crepes rolled delicately beside each other in a sea of lemon splashed sugar, there’s a perfect pancake for every hour of the day and now, in Where the Pancakes Are, there’s a perfect place to satisfy the most base of pancake desires. 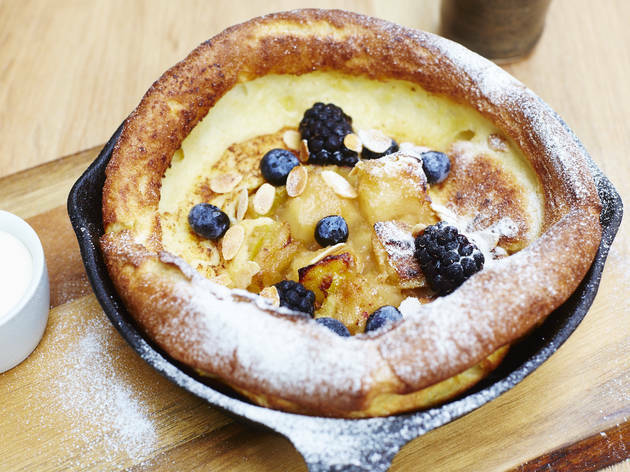 Located in Flat Iron Square, south London’s newest foodie hotspot, this mecca for all things flipped boasts sweet, savoury, Dutch babies, monthly specials and afternoon tea…there’s more than enough on this menu to warrant a second, third or sixth visit. A Welsh Rarebit selection was umami heaven; gorgeously heavy on the cheddar and smacking of ale, it was savoury and deeply delicious though a couple less grilled (but slightly chewy) spring onions would have been fine with me too. The brisket stack from the specials menu was a stroke of genius though and deserved congratulations to both the chef for creating it and me for absolutely cleaning the plate. Pulled beef, pastrami, brisket, gruyere, sauerkraut, gherkins and thousand island dressing all came together in joyous, and frankly, wonderful matrimony. Savoury choices come in at around £10 for generous portions while sweet top out at £9. 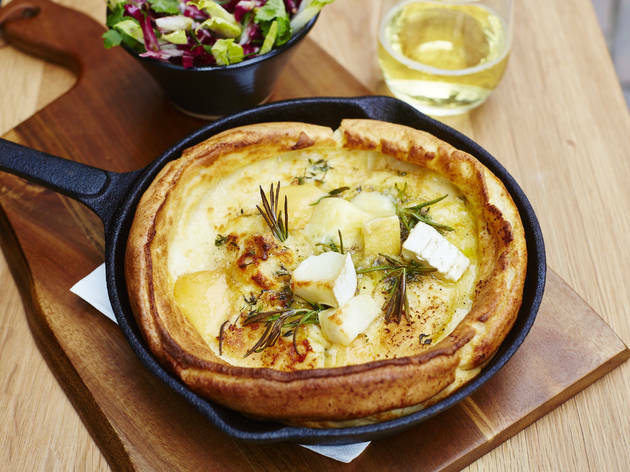 The afore mentioned Dutch Baby rolled onto my must-eat-next-time list owing to its 20-minute cooking time and my grumbling stomach but an uncouth ogling of the table next to ours led me to confirm that yes, it did look freaking awesome. Juices, cocktails, beer, cider & hot drinks are all on offer; the freshly pressed beetroot with carrot, lemon, apple & ginger was spot on for making me feel healthy between great gobbling mouthfuls of pancake and the service, although a bit hit & miss in terms of speed & engagement, was pleasant enough. Made with organic buckwheat flour and high welfare eggs & buttermilk, these pancakes also give you the option to go vegan, dairy or wheat free in confident style here. If you’re a North London gal, it’s a bit of a trek to get here and on the day we went, there was little else that looked open or inviting but the steady stream of people in and out of this place left me in no doubt that the time is right for a love affair with pancakes to be rekindled and for that, I can only be very happy. 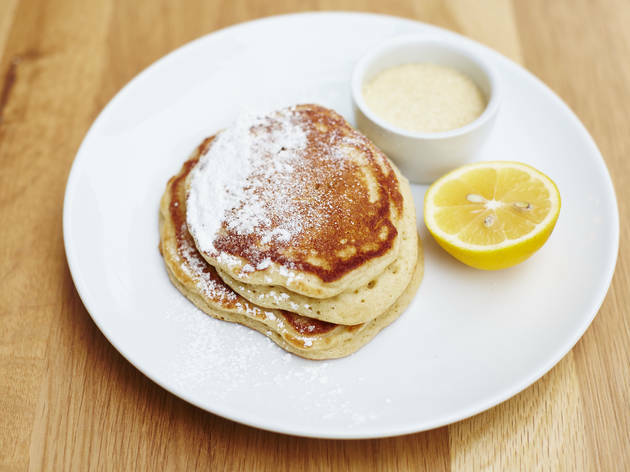 Located within lovely Flat Iron Square, Where the Pancakes are does exactly what it says: serves some of the best pancakes in London. 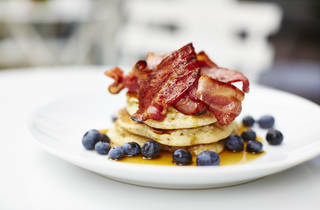 The menu offers a great variety of pancakes, savoury and sweet. I decided to go simple and tried The American - pancakes topped with maple syrup, bacon and blueberries. The pancakes were light and fluffy and the toppings fresh and tasty. The service was excellent and everyone was really friendly and nice. Sitting is offered both inside and outside; what's better than a pancake in the sun? After reading reviews on this place, I knew I had to pop down in my spare time. The place is in the middle of Flat Iron Square with lots of other vendors to choose from. It's a really cute cafe with seating both up and down. A pastel interior and lots of cute touches, like books, art and sprigs of plants. The staff were very friendly and accommodating. I went for the blueberry, cream and maple syrup pancakes, whilst my friend had the American stack. The pancakes were buttery, fluffy, light but so satisfying! Gorgeous! Their house cream was just right, in terms of sweetness and freshness and the blueberries were nice and crisp. Their fresh green juice was also delicious. Overall, a delight and I would definitely return. I loved it! I had the green pancake which was full of green veg! Loved it and can't wait to try their Dutch pancakes but you have to share that as it's huge! Where The Pancakes Are, a super lovely place. Food and interior are on point and such a great atmosphere while you get served some really fluffy and yummy pancakes. The owner is such as inspiring as her dishes, she opened this place after doing this fir years on food markets and I think that was the best decision she could have make. I had some 'normal' pancakes as well as her dutch babies, which are served in a big pan. I must say the portions of them are great, for the 'normal' pancakes they could be a bit more for the price you are paying. Not to say that they are worth of the quality you are getting, but I wasn't that full after all and I wanted to have them as my whole lunch. After all a sport I can recommend if you you have friends you like a great pancake place with a big variety of flavours. Where the Pancakes Are is located in the lovely Flat Iron Square Market, a five minute walk from London Bridge. We went on a Sunday at 12:30 and it was very busy, with a 30 minute wait for a table inside, but we only had to wait a few minutes for one of their three outdoor tables. Even though we were outside, the service was okay and it was nice to have a view of the Shard and Flat Iron courtyard. I ordered the sweet Dutch baby, a sort of large flat Yorkshire pudding served in a cast iron skillet with apples, pomegranate seeds and creme fresh. Despite the menu saying it would take 20 minutes to prepare, it was ready in about 10. My boyfriend had The American which was a stack of pancakes with maple syrup, blueberries and bacon. Both were delicious and although the restaurant was very busy, staff were still friendly and did their best to accommodate everyone. This is a great spot to know about when you're craving brunch food later in the day when many places have stopped serving it. 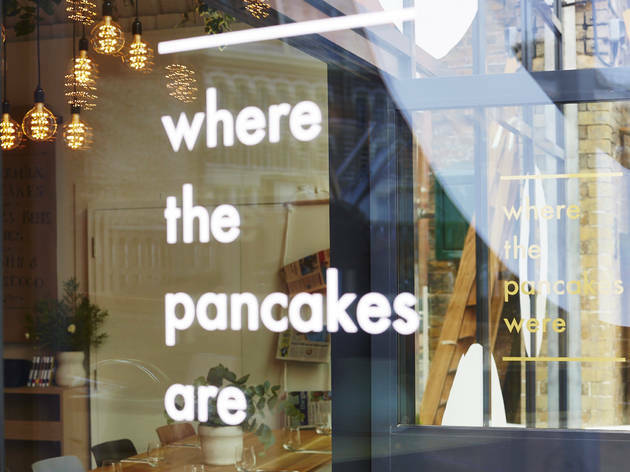 Where the Pancakes Are has recently opened in the new Flat Iron Square in Borough. I went down for brunch on Sunday and although it was a bit of a slow start to get a table, once we were seated, we had a great time. You can book a table so I would definitely do that next time. The girls working were very helpful in squeezing us in. I had the simple pancakes which is quite a small portion with two pancakes and maple syrup, but they were the most delicious fluffy pancakes! My cousin had the savoury sandwich which was basically a ham and cheese toasted sandwich but with pancakes instead of bread... it also tasted amazing! The coffee ain't bad either and you can finish you're morning off with a walk around the flea markets on Sundays. Can't wait to go again to try a Dutch Baby!